The map shows distinct regional patterns that reflect differences in rural well-being and economic development prospects between recreation/retirement destination counties and persistent population loss counties. Understanding the demographic trends of rural communities helps USDA and other organizations plan investments and services. Many rural areas may lack sufficient capacity to address the growing challenges associated with aging. Much of USDA housing assistance, support for community facilities, and broadband investments directly serve the needs of older populations. Why are rural areas aging? Many rural counties grow older because they attract retirees, usually because they are scenic or recreation destinations. 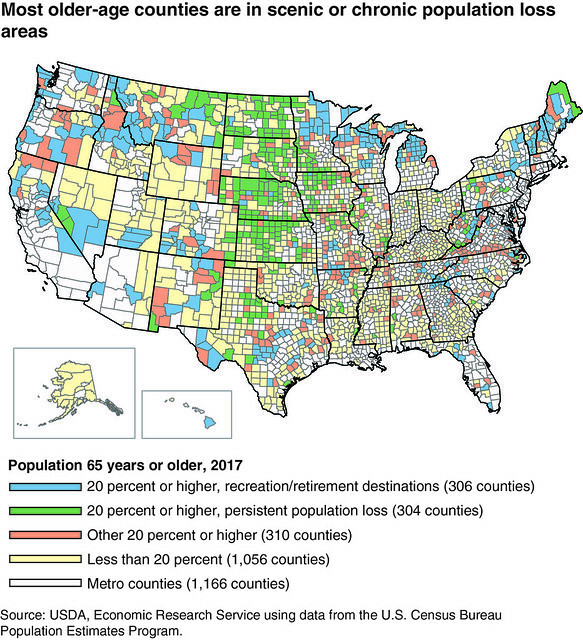 One-third of older-age counties are classified by the Economic Research Service as either retirement destinations or as having recreation-based economies. These counties are concentrated in the Upper Great Lakes, the Appalachians and Ozarks, Texas Hill country, and throughout the Rocky Mountain West. Most of these counties have seen an upturn in population growth caused by more people moving to them since 2013. Other rural counties grow older because the people moving out over the long-term consist overwhelmingly of young adults. This loss of young adults and, in effect, their future children leaves behind an older population. One-third of older-age counties are classified as persistent population-loss counties and are primarily located in the Northern Great Plains and Corn Belt. Net migration has decreased in many of these counties since 2013. The map shows distinct regional patterns that reflect differences in rural well-being and economic development prospects between recreation/retirement destination counties and persistent population loss counties. Retirement/recreation counties are located closer to large cities and have larger populations than counties with persistent population loss. Persistent population-loss counties tend to be concentrated in sparsely settled, remote regions where transportation, healthcare, retail, and other needed services are generally harder to access and maintain. For more information on rural population trends, see the ERS report, Rural America at a Glance.